Convergence devices are the rage these days, just put your hand in your pocket and pull out that iPhone of yours. With the apps and accessories going for it, it is much, much more than just a phone. Well, home appliances do some convergence as well, although not as much. Take for instance, the Breville Radio Toaster – the name alone gives the game away, where you can enjoy to your favorite breakfast of toast with marmalade, while tuning in to the wake-up calls of radio DJs on a station of your choice. 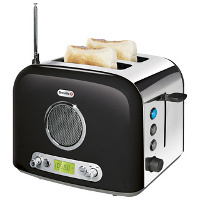 Currently up for pre-order, the Breville Radio Toaster will cost you £49.99, but that is a small price to pay considering the wonder that this toaster will invoke whenever you have a guest who stays over at your place in the morning and wakes up to the sweet smell of perfectly toasted bread as well as their favorite artiste singing in the background. Now, for Breville engineers to go back to the drawing board and include a coffee maker in this puppy for the next iteration. Surely that is not too much to ask, no?